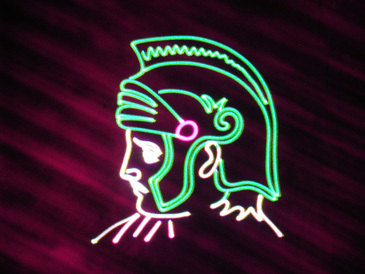 A scene from the Laser show "Our Republic's Birth"
(Left) Rotunda by the water at the historic Palace of Fine Arts, San Francisco. 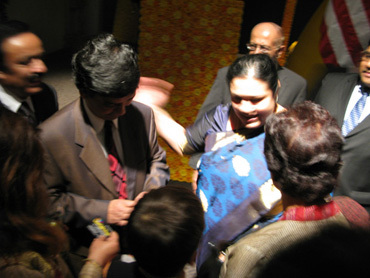 (Right) The winning smiles from Manick Sorcar, Mrs. Susmita Thomas - the Honorable Consul General of India in SFO, and her husband Mr. Thomas P. Thomas, after the show. The 61st Republic Day of India was celebrated at the historic Palace of Fine Arts amidst the gathering of over 400 invited guests from around the country. 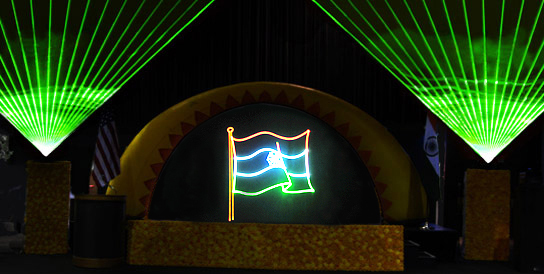 The highlight of the event was a half-hour unique laser tribute "Our Republic's Birth" by Manick Sorcar. 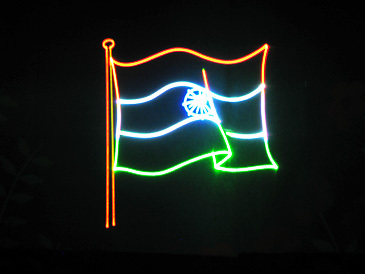 It took the audience for a magical journey starting from the Indus Valley Civilization of 3300 BCE to the Republic Day, touching the many significant milestones of India's history. 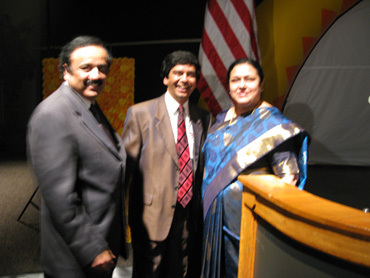 Manick Sorcar was invited by Mrs. Susmita G. Thomas, the Consul General of India in San Francisco to do the one-of-a-kind show which proved to be a phenomenal success. 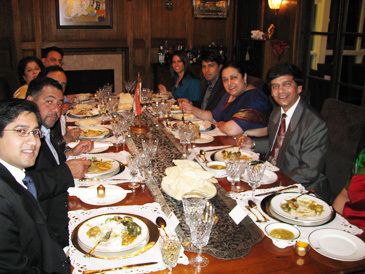 Apart from the personnel of the Indian Consulate office, it was attended by dignitaries from around the nation including the Mayor of San Francisco, the Honorable Consul Generals of Japan, Republic of Hungary, among others. January 25, 2010. 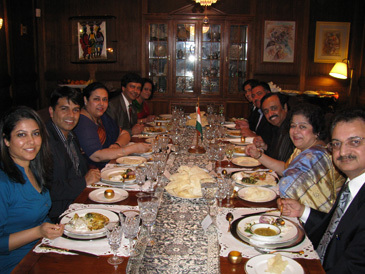 At the dining table of the Consul General's residence: Manick and Shikha Sorcar, their daughter Piya and her husband Shuman Ghosemajumder were invited guests with others at the Thomas residence. 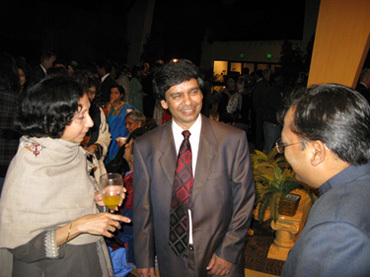 Consul General Mrs. Susmita G. Thomas is seen next to Manick on the left picture. 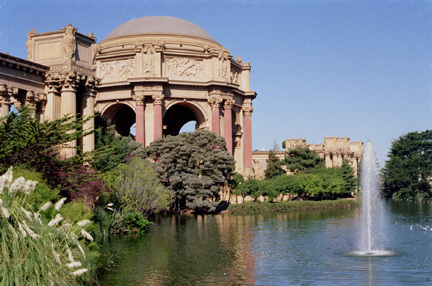 (Left) Decorated stage at the Palace of Fine Arts before the show. 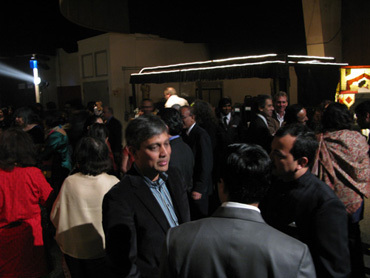 (Right) People started gathering and soon it was packed with over 400 invited guests from around the nation. 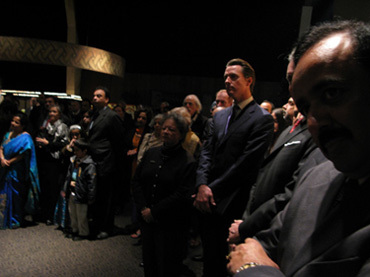 (Left) San Francisco Mayor Gavin Newsom with other guests. 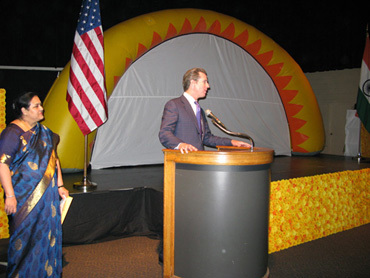 (Right) Mayor Newsom welcomes guests and congratulates for India's 61st Republic Day celebration and declared the day "Indian Heritage Day in the great city and county of San Francisco". 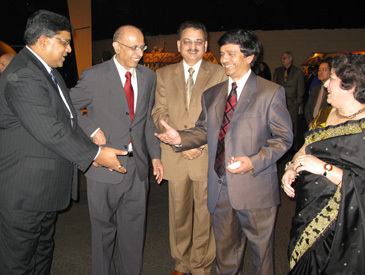 Consul General of India Mrs. Thomas is on the left. 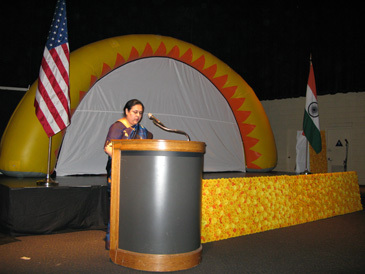 (Left) Mrs. Thomas welcomes guests and said "You share with us a common link, a thread of affection that belongs to all of us to India. 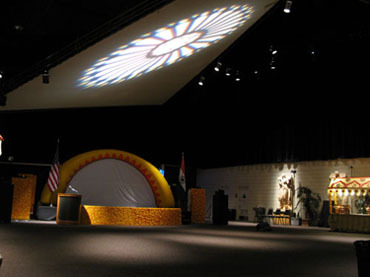 Thanks to your building bridges between India and the United States, your successes have brought us together". A message from California Governor Arnold Schwarzenegger praising India's admirable "mesh of culture" was read aloud on the occasion. 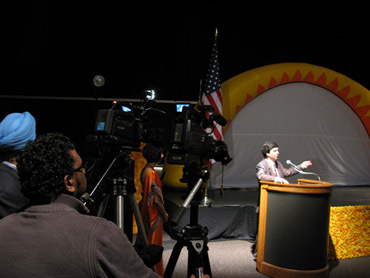 (Right) Manick gives a short introduction of the show. 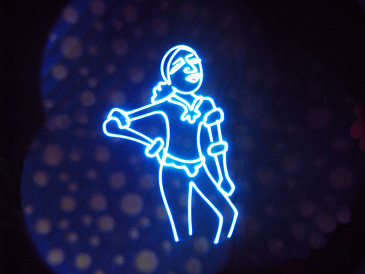 He said, "My father's first item in his magic show was 'The Enchanting Garden'. He would show a small empty box and then with abracadabra start pulling out a series of surprises - starting from hundreds of flowers to dozens of flowering plants, birds, doves, ducks etc. which would soon fill and decorate the entire stage as the Enchanting Garden. My challenge is just the opposite; I have to put them back in a smaller box. 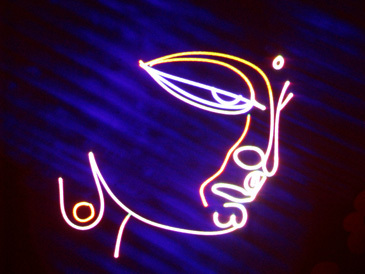 I have to take India's 6000 year old history and capsule it in a 26 minute laser show". 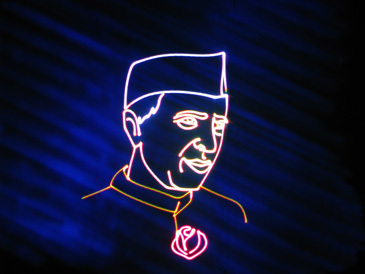 "Our Republic's Birth": The unique light and sound show was a perfect combination of fabulous sound tracks of the different era of Indian history, and life size graphics and animation made with the cutting edge technology of Laser. 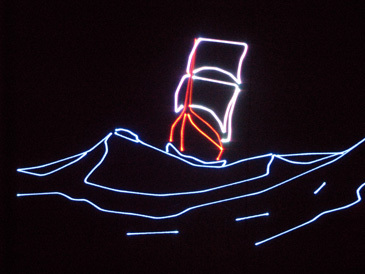 Multiple Laser projectors were used for the coordinated colorful graphics and animated movements on the large arched screen, in addition to creating three dimensional visual spectacles in space above the audience. 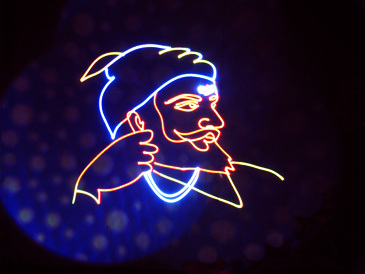 "It was indeed an impressive show, very well encapsulated and artistically presented, and I was privileged to see it" said Vishnu Sharma, Associate Executive Director of Community Relations, Indian Community Center of California - which reflected the feelings of the majority. "Congratulations! Very nicely done! ", said Yasumasa Nagamine, the Consul General of Japan. (Left) "Congratulations! Fantastic show! ", a smiling Mrs. Thomas was the first to congratulate Manick. Everyone was thrilled with the show. "It was very emotional, it brought tears in my eyes", said many who are familiar with India's history and her struggle for freedom and could see it come alive in front of the eyes. 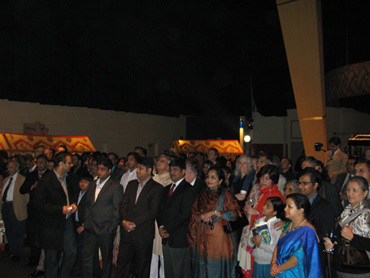 "Fabulous Show" said Eva E. Voisin, the Consul General of the Republic of Hungary. 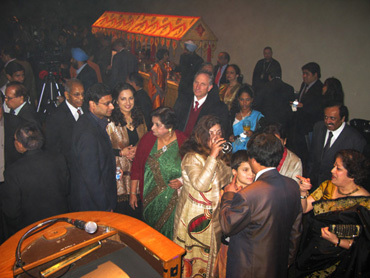 (Right) Manick and Shikha amidst the admirers. (Left) "Simply great!" said Mr. Debadatta Dash and Mr. Habib M. Habib, Co-Chairs of WASITRAC. 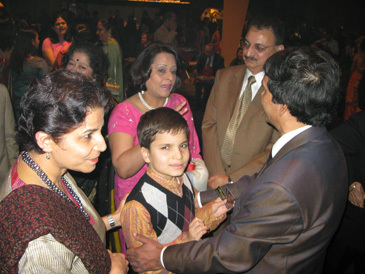 (Right) With Ms. Nandini Tandon, TiE Global, Board of Trustee, her son, and Mr. and Mrs. Purshottam Bhatnagar of the Consulate General of India, SFO. 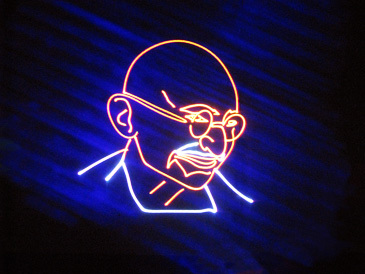 "San Francisco - Visitors to a Republic Day celebration hosted by the San Francisco Indian Consulate at the Palace of Fine Arts Jan. 26 were treated to a dazzling laser and light show depicting India's history through the mellinia - from the ancient Maurya empire all the way up to Gandhi's freedom struggle. 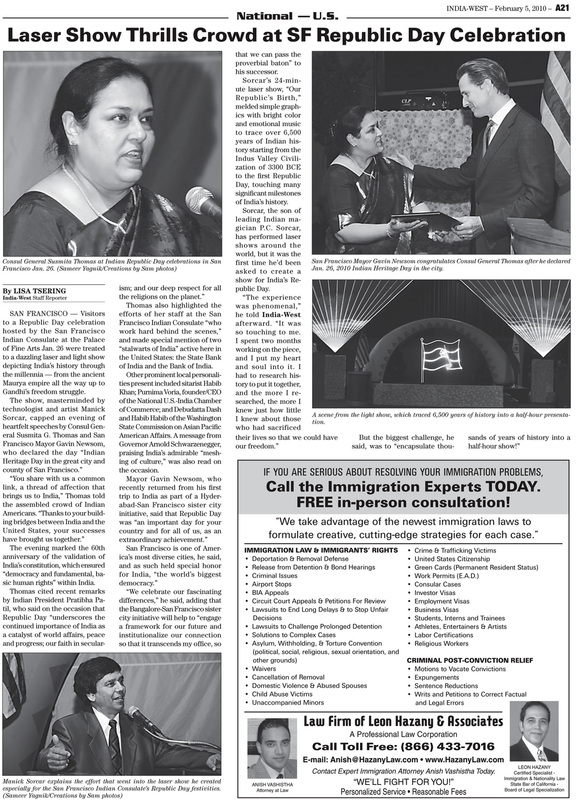 The show, masterminded by technologist and artist Manick Sorcar, capped an evening of heartfelt speeches by Consul General Susmita G. Thomas and San Francisco Mayor Gavin Newsom..." For complete report click here.